The InDesign plugin is a great time saver and highly recommended for anyone working with InDesign files in Swivle! This article describes how to install the plug-in for the first time and how to update an existing installation. Please note that the InDesign plugin is only available for Content Manager users. The InDesign plugin supports CC 2014, CC 2015, CC 2017, CC 2018 and CC 2019. Note: if you are currently running the 'Elvis InDesign plugin' (version 3.2.x), please manually remove this plugin before or after installing the 'Swivle InDesign plugin'. Step 2: go to the download folder for your operating system (OSX or Windows) and open the installer. Step 3: follow the steps in the installer. Once the InDesign plugin is installed, you will be notified when a new version is available for download. Click Not Now to dismiss the message. It will appear the next time you log in to Swivle or when next starting InDesign. Click Skip Version to dismiss the message. It will not appear until a next new version is available. Click Download to access this download page. Download the installer from above, run it and follow the instructions on screen. If your currently installed version is older than 3.3.1.614, you will need to upgrade to 3.3.1.614 or newer be able to login. Figure: The "Swivle" menu contains options for connecting to and working with Swivle. Swivle Path. The path of the linked file on Swivle. Swivle ID. 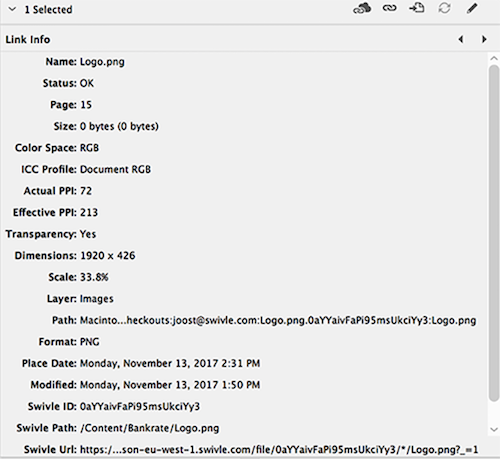 The Swivle ID of the linked file. Swivle Url. The URL to the Swivle object of the linked file. Figure: The options in the Links Panel Options dialog. Figure: The Links panel with options shown in the Link Info pane. 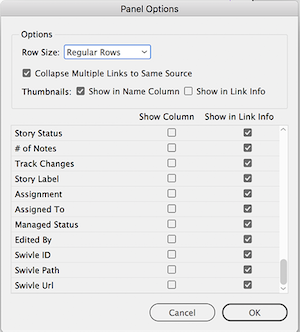 An About Swivle Plug-ins... option in the InDesign menu (on Mac OS X) or Help menu (on Windows). This will display which version of the InDesign plug-in is installed.